For the ultimate Mt. Rainier tour experience, look no further this exclusive helicopter flight and hiking tour combination experience. 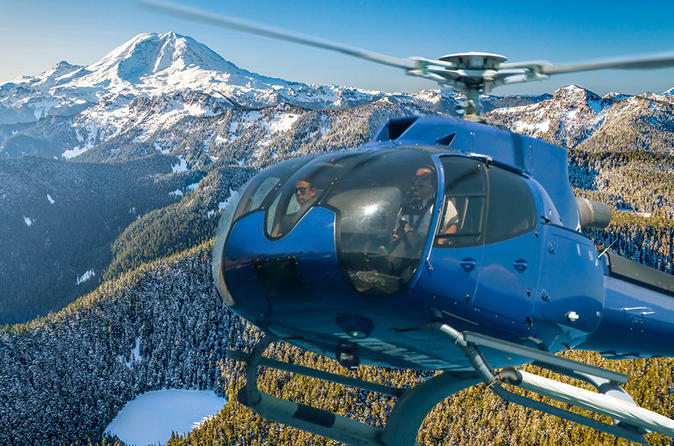 With 369 square miles of rugged mountainous terrain and Washington's highest peak at it's core, this incredible helicopter flight and ground tour combined together is the only way to see the most of Mt. Rainier in a single day. Your tour includes a 35 minute flight between Seattle's Boeing Field and Mt. Rainier National Park, a flyby of Snoqualmie Falls, a 4 hour ground tour through the National Park itself, and a delicious catered meal for your group in the National Park. This is a private boutique tour experience, and is limited to groups up to just 6 people. Your private group's Mount Rainier helicopter flight and hiking combo full day tour is divided into three parts: 35+ minute helicopter flight, 4 hour ground tour with naturalist hike, and a catered meal. As the helicopter's capacity is limited to either 1-3 passengers or 4-6 passengers. Small groups of 1-3 passengers will fly in a 4-seater Robinson R44. Large groups of 4-6 passengers will fly in a 7-seater Airbus H130. Private groups on the morning will have lunch in the Park before flying back to Seattle. Private groups on the afternoon tour will have afternoon tea and a light meal before the return trips to Seattle in the early evening. Please contact us for further details! In a 4-seater Robinson R44 or 7-seater Airbus H130, you'll soar over the Mt. Rainier Wilderness, getting up close with peaks, glaciers, waterfalls and thundering rivers that would take days of strenuous hiking to reach from the ground. Between Mt. Rainier and Seattle, your pilot will even take you on a close flyby of Snoqualmie Falls and you'll glide over the Cascade foothills' lakes, rivers and dense forests. You'll enjoy incredible photography opportunities with a bird's eye view of all of this stunning scenery. On the clearest days, you'll also catch glimpses of Mt. Baker, Mt. Adams, Mt. St. Helens, and even Mt. Hood in Oregon--5 of the greatest Pacific Northwest Peaks in a day! As you fly along, your expert pilot will point out the sites and maneuver the helicopter to offer the best views. Once on the ground at a secluded location surrounded by plunging valleys, your ground tour guide will take you to experience the best of the National Park that you won't get to see from the helicopter: walk through a towering old growth forest, gaze across wildflower fields that burst with color in the summer sun, and feel the cool spray of mist from crashing waterfalls. You'll learn about the mountain's geologic history, diverse climate and stunning glaciology. On a moderate hike, you'll breath in the freshest mountain air and search for wildlife in the forest and sub-alpine slopes. Stopping frequently to marvel at the scenery around us, countless photography opportunities await you around each bend in the trail. We want you to eat well during your full day excursion with us. Your private tour with us includes a delicious, beautifully catered meal in the midst of Mt. Rainier's natural splendor.